Book Description: For students, the high cost of educational resources and textbooks can be a serious obstacle to the accessibility and affordability of a post-secondary education. For instructors, traditional educational resources may also present a barrier to innovation in teaching and curriculum design. Fortunately, open educational resources (OER) provide a viable solution to both these issues. OER can be accessed for free online or printed at a fraction of the cost of a traditional textbook, and can be edited to better fit the curricular or pedagogical goals of an instructor. Step One: What Are OER, Why Are They Important, and What are the Barriers to Adoption? Step Two: What Already Exists On Your Campus? The high cost of educational resources and textbooks create a serious obstacle to the accessibility and affordability of a post-secondary education. Traditional educational resources also present barriers to innovation in pedagogy and curriculum design. Fortunately, open educational resources (OER) are a viable solution to both these problems, since they can be accessed for free online or printed at a fraction of the cost of a traditional textbook and can be edited to better fit the curricular or pedagogical goals of an instructor. OER Student Toolkit by BCcampus is licensed under a Creative Commons Attribution 4.0 International License, except where otherwise noted. This document has been prepared by Daniel Munro, Jenna Omassi and Brady Yano. Content found within the document was inspired by Making Textbooks Affordable, Student Government Toolkit published by the Student Government Resource Center as well as the Open Educational Resources (OER) Guide for Students in Post-Secondary and Higher Education published by the Commonwealth of Learning. 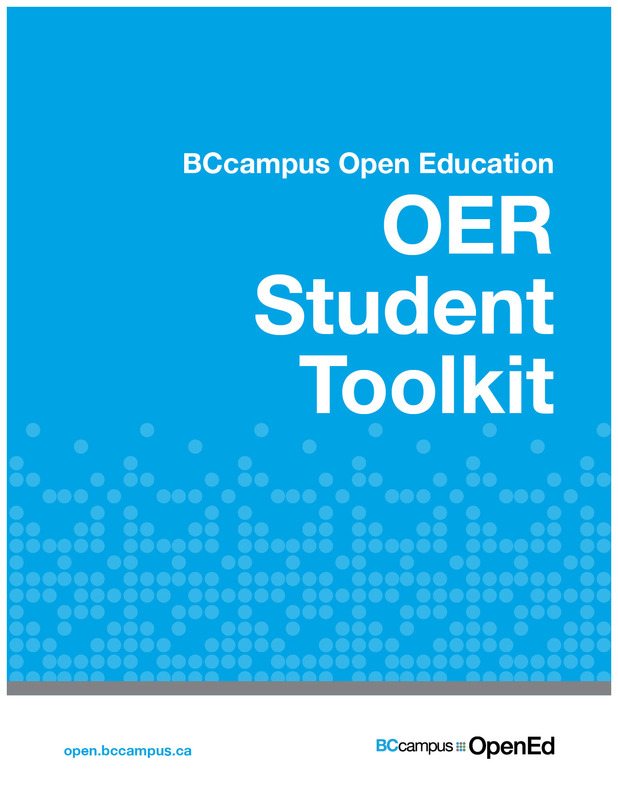 The BCcampus Open Education OER Student Toolkit by Daniel Munro, Jenna Omassi, and Brady Yano is used under a CC BY 4.0 International Licence.